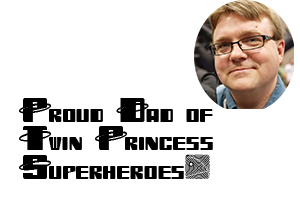 Two of the -- about 6 -- game designers that I credit with helping to lift role playing games out of the ghetto of the dungeon crawl and into the world of narrative play are Aaron Allston and Greg Gorden. To this day, I still love a good dungeon crawl, but it was designers like Allston and Gorden who showed me that role playing games could be an immersive, interactive, narrative experience that would last for years. They did this by designing games that provided excellent advice for game masters and designing mechanics that fostered/supported narrative play. I mentioned that Allston was one of the first people to review the Champions role playing game in my H is for Hero System entry. Allston was a quick convert to the system, but he also became one of its biggest promoters and one of Hero Games' better freelance game designers. His Strike Force sourcebook is one of the best super hero game campaign guides ever written, and its advice for running gaming sessions/campaigns are valuable for game masters running any gaming system. 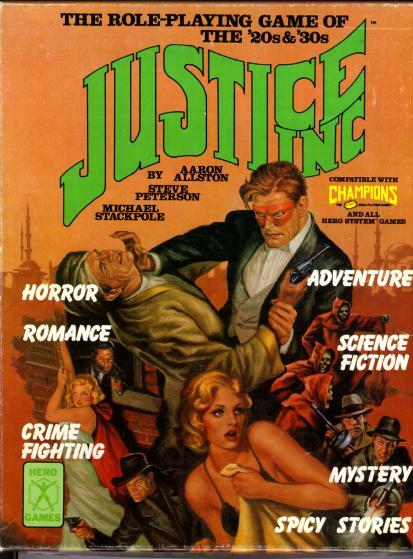 In 1984, Aaron Allston and Mike Stackpole (who had also worked on Mercenaries, Spies, and Private Eyes) joined the staff at Hero Games to design a role playing game that would allow players to experience the pulse pounding action of the pulp stories of the early 20th century. The book is nearly flawless in its presentation and design. The mechanics are clearly presented and are able to simulate the wide array of stories that were featured in the pulps. But the greatest asset of Justice Inc. isn't the rules, it is the Justice Inc. Campaign Book. This booklet is a fantastic collection of essays that discuss how to run a role playing game campaign. The book covers everything from Crimefighting, Espionage, Action and Horror to Spicy Stories and Science Fiction. It truly covers the pulps as a whole and doesn't get caught up in the erroneous mindset that pulp only equals "The Shadow" or "The Spider." Those are great characters, to be sure, but the pulps include Robert E. Howard, C.L. Moore, H.P. Lovecraft and others. The stories run the gamut of genre, and Allston and Stackpole know their stuff. The advice in this 80 page book belongs in any game master's library. 1) A Gamemaster is an entertainer. 3) Be firm and consistent. It was the first rule on that list which was mind-blowing to me when I first read it. It was a direct argument against the "DM is God" mentality that was prevalent during the early era of role playing games. It put the onus on the GM not to just "challenge" the players, or to crush them at a whim, but instead to make sure that the players are having fun. To quote the discussion after the rule, "The thrill of discover, the heart-pounding moments of suspense, and the laughs from humor beat the hell out of the drudgeries of constant warfare and treasure harvesting." It is a mantra that I have tried to live up to for years. Sometimes -- as is the case with some of my 4e sessions -- I fail, but I think that my Eberron players have had some pretty good times and have some stories to share. Rising up from the ashes of the acquisition of SPI by TSR in the early 1980s, Victory Games -- made up of former SPI employees -- released the James Bond 007 role playing game in 1983. After TSR had purchased SPI, TSR largely ignored SPI titles and it seemed that the acquisition had more to do with limiting competition than acquiring useful IP. Ironically, it was the Lorraine Williams era of TSR that re-released a lot of the neglected SPI titles. 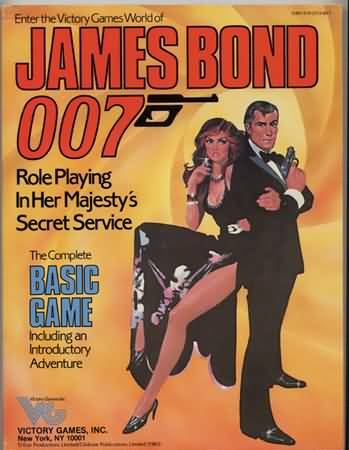 But if TSR had never purchased SPI, then Victory Games would never have been created and it is possible -- just possible -- that the James Bond 007 game would never have been designed and that would be a shame. Gerard Christopher Klug is credited with "Game Design, Development, and Project Coordination," but anyone who is familiar with the old SPI/Avalon Hill system of designing games knows that it is likely Gregory Gorden and Neil Randall (credited as "system development") who did the bulk of the innovative work on this project. Those who are familiar with Greg Gorden's other work -- DC Heroes, Deadlands, Torg, Star Wars and a host of other games -- can see his influence all over the place. There is a lot to like in James Bond 007. It has an easy to use rules system and some of the best adventures ever written for any game, but the contribution that altered the way that I viewed role playing games -- and informs my sentiments against "roll a skill check for everything" or "If the player doesn't know/ask it then they don't know/can't find out" mentalities of many GMs -- was their Fields of Experience mechanic. You see, in the world of James Bond, there are some things that the characters just know, and Gorden and crew came up with a system to emulate it. It isn't anything fancy, but it was revolutionary then -- and is still revolutionary as Robin Laws' Gumshoe system demonstrates for modern gamers. Put briefly, "There are no dice rolls involved when a character uses a Field of Expertise in play. He either knows the information required or how to perform the task, or he does not. A Field of Expertise will always fall into one of two categories -- information and performance." The GM notes go into even greater detail about Fields of Knowledge recommending that GMs use mechanics to step in to help when players don't ask questions. A lot of "mystery" adventures bog down in rpgs because the players fail a roll, or fail to "look under every nook and cranny of a room." In the world of James Bond, if the character had the Forensics or Cryptography Field of Knowledge that was enough to keep the ball rolling. Give the clues. Don't interpret them for the players, but let them have the information themselves. Sometimes, their own interpretations end up being better than your original idea and can take adventures down entertaining paths. This was the kind of play recommended by James Bond 007, and it was so different from the puzzle-deathtraps -- like Tomb of Horrors -- of other games that it changed the way I play forever. Both of these games are sadly out of print, but you can find them at fairly affordable prices on eBay. I cannot praise them highly enough. quite interesting! I played James Bond once, and Justice Inc. many more times... but never really knew about the Field of Knowledge rule. Yep, that one was extremely interesting, especially to some of us all reading the books at the time!